Can you identify times in your life when you have been worshipping God, but you weren’t in a church? My first memories of that were at camp, worshipping God in the splendour of His creation. But perhaps more surprisingly, I can still recount the first time I worshipped God in class. It was Biology 101. We were learning about the human body, and as I learned how this system worked with that system, I marvelled at the complexity and beauty of it all. I began to feel my heart lean toward Heaven. “What a wonderful Creator!” I wanted to yell. I did restrain myself, but that is the day I decided to be a science teacher. I wanted to share that amazing experience with students so that they too could worship our wise God in the middle of class. I have also caught myself worshipping God while playing my favourite sport, exploring colour on a canvas, writing a poem, or solving a crazy-hard maths problem (“Praise the Lord, I finished!”). But in seriousness, how do we define worship? If it is only singing in church, we have narrowed the chief aim of our life to one hour on Sunday. Years ago, I heard that worship means reflecting back to God His worth-ship, His worthiness. So, when we teach the throughline of God-worshippers, we are wanting our students (and ourselves) to reflect back to God how worthy He is of our praise. We don’t need to be in a church to worship God, we don’t even need to be singing, although singing is a great way to worship. Worship can be anywhere, anytime we realise and recount just how different, radical, stunning, amazing, truly awesome our God is. I have also found the Encyclodpedia of Bible Truthsby Ruth C. Haycock, an invaluable reference. She has listed appropriate verses for each subject matter. It was through her research that I made an invaluable connection. I was teaching 8thgrade Chemistry at the time and enjoyed teaching the skill of balancing equations. To me it was like a strategy puzzle. 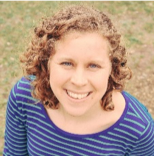 What I hadn’t connected on my own was the way that balancing chemical equations was actually a reflection of God’s character. You see, one side of the equation has to balance with the other side. In a chemical reaction, nothing can be created or destroyed, it just changes form. Through her book I came to see that John 1:3 was describing this very law of nature, “Through him all things were made; without him nothing was made that has been made.” We can balance equations because nothing can be created or destroyed without God. He is the Transcendent Law Giver. As this truth hit me, I was able to lead my students to it the next day with questions like, “Why can we balance equations? Does this work every time? What if we could create and destroy matter? Who is the only one that can create and destroy?” In those few moments we were able to discuss and reflect on the character of God and hopefully that led to worship. I was recounting just how powerful and wise is our God. I can tell you I was worshipping! And that is where teaching the throughline of God-worshippers begins – with you, the teacher, worshipping God regularly in the middle of class. What a joyful calling this is! 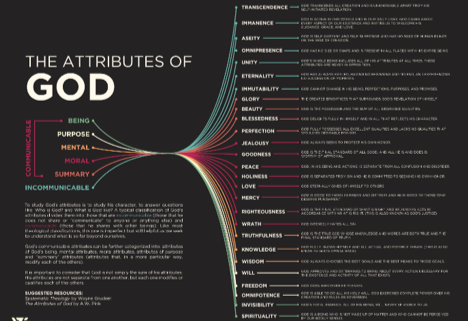 Photo Credits: Attributes of God. 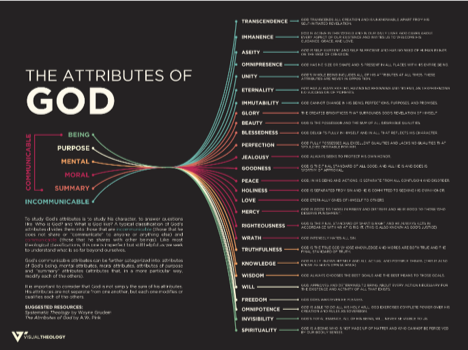 Free poster available to downloador for purchase from Visual Theology. 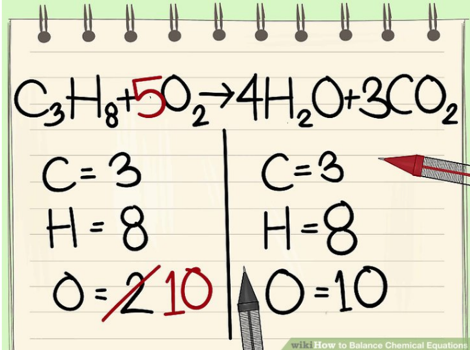 Chemical Equations.via WikiHow. cc.